A simple, fast, and universal suspension polymerization method was used to synthesize the molecularly imprinted microspheres (MIMs) for the topical anesthetic benzocaine (BZC). The desired diameter (10–20 μm) and uniform morphology of the MIMs were obtained easily by changing one or more of the synthesis conditions, including type and amount of surfactant, stirring rate, and ratio of organic to water phase. 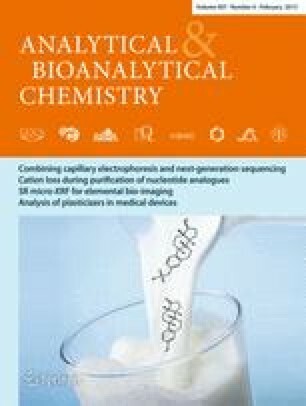 The MIMs obtained were used as a molecular-imprinting solid-phase-extraction (MISPE) material for extraction of BZC in human serum and fish tissues. The MISPE results revealed that the BZC in these biosamples could be enriched effectively after the MISPE operation. The recoveries of BZC on MIMs cartridges were higher than 90 % (n = 3). Finally, an MISPE-HPLC method with UV detection was developed for highly selective extraction and fast detection of trace BZC in human serum and fish tissues. The developed method could also be used for the enrichment and detection of BZC in other complex biosamples. The online version of this article (doi: 10.1007/s00216-014-8420-5) contains supplementary material, which is available to authorized users. This work was supported by the National Natural Science Foundation of China (21107018, 21477026), Science and Technology Key Project of Ministry of Education (212129), Natural Science Foundation of Guangdong Province (S2012010008172).